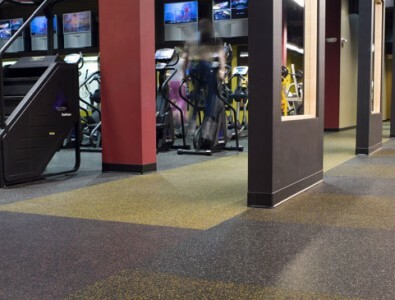 Everlast Roll rubber fitness flooring from Surface America is highly durable and stands up to tough conditions found in high-traffic fitness and exercise areas. It can withstand the pounding of dumbbells and the weight of fitness machines – and always looks good. Everlast Roll is not affected by moisture or extreme temperature changes, so it’s a smart indoor rubber flooring choice for locker rooms and pool areas. Everlast Roll fitness flooring is a very durable rubber roll made from pre- and post-consumer recycled materials. Its unique manufacturing process delivers perfect uniformity in density and thickness from roll to roll – there are no soft or hard spots, and no lips at the joints where rolls abut. Everlast Roll is also highly resistant to type “B” ultraviolet rays from fluorescent lighting. Everlast Roll is made of 100% post-consumer recycled SBR (styrene butadiene rubber) and 100% postindustrial recycled EPDM (ethylene propylene diene monomer) rubber.